1. The trips! There is nothing like sleeping under the crystal clear starry night sky in the forests of Maine. Cooking our own food and roasting s’mores around the campfire and of course telling spooky stories and singing lots of campfire songs. Learning how to survive in the wilderness is a lifelong skill that stays with you. Besides all the amazing camping trips, we took some phenomenal non-camping trips as well. Whale watching was always a favorite! The whales literally jump out of the water right next to the boat, it’s spectacular! As we got older at camp we went to Bar Harbor, Old Orchard Beach, Ogunquit and when we were the oldest campers we went to Quebec, Canada for four days! You definitely can’t do that from New York or Pennsylvania. 2. Lots of Lakes. 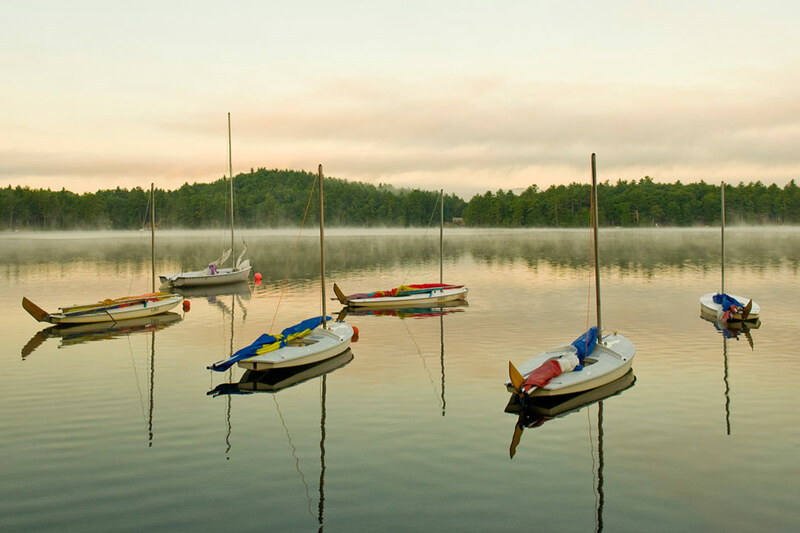 Maine has 2,200 lakes perfect for canoeing and kayaking not to mention amazing white water rafting adventures. My favorite canoe trip was down the Saco River- but it is hard to choose. One of my favorite camp activities was water skiing frequently around our large lake which seemed endless, something you can’t do in a pond at camps in other regions. The Maine coastline is amazing and I can remember trips to the beach and swimming in the Atlantic Ocean! 3. Mountains galore. There are over 60 mountains to hike and climb in Maine. As someone who had a fear of climbing mountains, to reach the peak of Mount Katahdin (one of the highest peaks in New England at 5,268 ft.) it was a life changing accomplishment I will never forget. 5. Food glorious food! Fresh lobster dinner? Check! Pick your own juicy blueberries and/or enjoy scrumptious blueberry pie? Check! Delicious ice cream? Oh yeah. The best ice cream in Maine is Ben & Bills in Bar Harbor. They make their own ice cream and they even have a lobster flavor! 6. Easy to get to, hard to leave. Maine is an easy drive or a quick flight from most places in the Northeast. The best thing to do is make a vacation out of your visiting day! With hundreds of Bed and Breakfasts to choose from and tons of summer events going on, you will be counting down to the summer right along with your child! 7. Acadia National Park. You can spend a day or a week – there are so many fun things to do! Do not miss watching the sun set on Cadillac Mountain. The views are incredible and the kids will love climbing the rocks. Another must see in Acadia National Park – listen to the Waves at Thunder Hole – where the water crashes into rocks made of granite and the sound that erupts bears a striking resemblance to thunder – hence the name. 8. The Staff. People from all over the country and all over the world are counselors at overnight camps in Maine. Some of my favorite counselors who I kept in touch with long after camp ended were from England and Sweden. Maine has the highest return rate for staff due to the amazing facilities and appeal of spending the summer in Maine. Therefore the counselors you start off with your first summer may return again and again throughout your camp experience. Many prior campers also go back to their camp to be counselors. Meeting different people from all over the world is not something my friends who went to camps in other states can relate to. 9. Shop ‘till you drop. Freeport Maine is home to the original and largest L.L. Bean store and fabulous outlet shopping. Parents and campers love to go there and explore the area. There are always fun events to attend, like L.L. Bean’s Summer in the Park Series for kids and families. You can check out all the great summer events here. 10. The bond that never breaks. The friends you make at camp in Maine are special, they are friends for life. Families from all over the country (and all over the world!) send their children to camp in Maine- my close friends were from Florida, Ohio, Arizona and my cousin went to Maine from California. We know the camps are timeless; they have amazing traditions that surpass generations. When you find another person who went to camp in Maine or sends a child to camp in Maine, there is a knowing smile and an automatic bond. You both know that you are in on an incredible secret! That’s why summers and camp belong in Maine!